It’s the song every kid can play on the recorder. Hot cross buuuuuns (squeak! ), hot cross buuuuuns (sqwark! ), one-a-penny, two-a-penny, hot cross buuuuuuns, EVERYBODY NOW! OK Debbie downers, you don’t have to sing along to my fruity tune, but after tasting some of the best hot cross buns on the Sunshine Coast AND considering my name is Penny, WHO by the way just so happens to be obsessed with those doughy lumps of heaven, I am in a completely nutty kind of mood! Seriously though, aren’t they just the greatest bakery product ever invented? Especially the white cross bit. How does that flour/water mix taste so darn good? It’s pure magic! And people who get angry about them coming out early, I mean honestly? So to those of you still humming the tune, here’s where we rate as having the best hot cross buns on the Sunshine Coast! Picture this: a cozy Sunday morning with a Ricks hot cross bun in one hand and latte in the other - could it get any better than this? We're defs thinking not. These mouth-watering creations are dreamier than the chocolate you'll be consuming over Easter and that's a statement we'll never back away from. These guys have nailed the all-important fruit to dough ratio. For them it's a recreation of the classic and we love the simplicity of it all. Not only is this place is a coastal legend, it's also Aussie renowned as being one of the best bakeries in the nation. So it's a given that these guys will be serving up some of the best hot cross buns on the Sunshine Coast this year. They just know how to create the perfect bun in time for Easter and even sprinkle their master creations with a light dusting of sugar. These perfect treats will have you craving them all year long. A big thanks from us here at TUL guys! We love Kenilworth Bakery. A Circa Cooroy extra-fruity hot cross bun is like no other on the Sunshine Coast. Located in the relaxed and beautiful Maple street, Circa is decked out with an onsite bakery, coffee roastery and French style café. Their hot cross buns are super soft, fresh and delish. The legends here create amazing baked delights every single day and Noosa locals are addicted to their goodness. So when Noosa Hot Bread Shop announced that they'll be baking hot cross buns this year it was a no brainer that we'd be jumping in and getting one of these puppies before they all go. Well, when an artisan bread shop jumps on the Easter train you know you’re in for a hell of a fruit bun ride. At Harvest Breads, there’s the traditional bun with hints of cinnamon and mixed spice, and an amazeballs gluten-free variety with dark chocolate and orange (jaffa lovers unite!). Now this is a take on a classic that is SURE to impress. Vanilla Foods likes to call it their raw hot cross bun. Around Easter time, sugar is at the top of everyone’s mind, BUT sometimes it’s good to take a healthier approach. This is where these organic and healthy hot cross bun concoction of goodness comes in and saves the day. For starters they taste bloody amazing even though they're actually raw, refined sugar AND gluten free! It’s a must try for all Easter lovers over the upcoming Easter long weekend on the Sunshine Coast. A fourth-generation baker, it’s understandable why Dutchy keeps his cards close when it comes to the secret ingredients in his insanely good buns (no, not the treadmill sort). But what we can reveal is they are fluffy, spicy, studded with the sweetest sultanas, and smell AMAZING. They also claim to be “the best on the Coast” with queues out the door on Good Friday. Set your alarm guys! Another one claiming to be the Coast’s best (game on bunnies!) this Woombye wholesaler sticks to the traditional bun version—“None of this choc-cross buns business!” says owner Matt. Strictly certified organic, sourdough, and hand-made, the buns at Walter’s take no short cuts in the baking process and are big business on the Coast, sold at most of the organic shops and delis in town—think: Kunara Organic Marketplace, Organika, Sunspace Cafe, B-Fresh, and Grub Organics. So no excuses for not trying these great balls of fire! Er… spice. It’s an apricot affair at Peregian Beach Bakery with the secret here being a hint of the furry orange fruit. Also featuring in the buns are sultanas, currants, raisins, and the all-important spice (they even import their spices from Belgium!). Each bun is hand-made fresh daily, plus there are no preservatives and hidden nasties. Chocolate lovers can also enjoy a devilish version closer to Easter. Don’t like fruit OR chocolate (who are you people? ), well don’t fret my bland friends, fruitless buns can be made to order! Fruit lovers line up! Noosa Outlook Hot Bread and Patisserie is another conventional-stay-in-the-lines type haunt, when it comes to their festive-season bread. Heavy on the fruit, the classic flavour is complemented by two types of cinnamon (it’s not the same with just one type, OK?) AND a special mixed spice. It’s a Spice Girls party in your mouth! 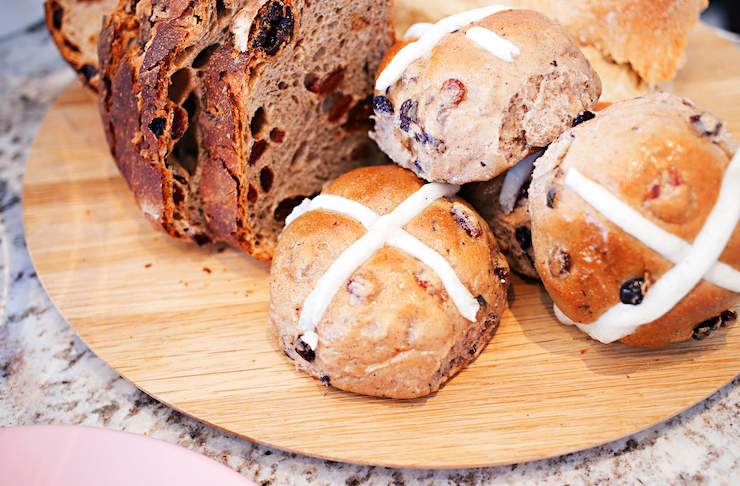 It’s officially hot cross bun season at Richie’s with their buns selling like hot cakes! The regular buns are made strictly with Australian sultanas (don’t mess with their sultana selection criteria!) and the chocolate buns feature the one and only Cadbury chocolate—holy Caramello Koala! The locals say they are the best on the Coast (here we go again), so there’s only one way to find out if they live up to their reputation—ready, set, go! Made from scratch daily by a baker who has 29 years’ experience in the industry (that’s a seriously over-qualified kneader! ), these buns are made with “nothing but passion and love”. With both choc-chip and the traditional raisin, Warana Beach Bakery sells a six-pack for just $4.50. Oh and during March you can indulge in a single bun with a small coffee for $3.50. AND if you ask nicely you might even get a side of mini chocolate eggs—now that’s community spirit! Looking for things to do this Easter? What about 6 Day Trips To Take Around The Sunshine Coast Over Easter? We've also ranked the best Easter eggs you can buy here.